Statistics on the size and shape of the sector in which we work are really only beginning to emerge in any interesting and useable fashion. However, despite the newness of available detailed information, there are some things that have been known for some time. In this first article, the numbers of organisations that operate in New Zealand will be discussed … and compared with similar jurisdictions elsewhere in the world. As unincorporated societies and groups. The Companies’ Office did not keep records of the last two of those four groups. organisations, give or take a few. increase in each group over that 20 year period – an average growth of 737 new organisations each year … or 14 new organisations per week, every week for 20 years. That’s 14,732 new mouths to be fed. It won’t surprise you to learn that the picture is not quite so simple. Firstly, it does not represent all organisations within the “Voluntary sector” in New Zealand. Factor in all the hobby clubs and other community organisations that are not inherently charitable, but which do operate within our sector, and the number of organisations within the sector balloons out to a massive 114,000 (as of 2103 by the way, so the equivalent 2015 number will be larger again). That is the size of the sector reported by Statistics NZ in their Non-profit institutions satellite account . Stunned? You could rightly be. It means that we currently have 1 community organisation for every 39 men, women and children in New Zealand. That ratio is down from 1 in 42 back in 2004 (adjusting for population growth). So, here’s a thought: if we’re really diligent we could conceivably have one community organisation for at least every adult New Zealand citizen by the time we celebrate New Zealand’s bi-centenary! And here’s another way at looking at the size of the sector. Since 2005, organisations wishing to benefit from tax exemptions must comply with the Charities Act. At the time of writing, New Zealand has 27,800 or so Registered Charities. That’s more than nearly 5000 more organisations than there are Charitable Trust numbers quoted above, Well, here’s the thing. You don’t have to be a Charitable Trust to be registered as a Charity these days. You may be a Charitable Trust, an Incorporated Society, a Private Company or indeed any other legal entity that meets the criteria of “charitable purpose’ defined in the Charities Act 2005. 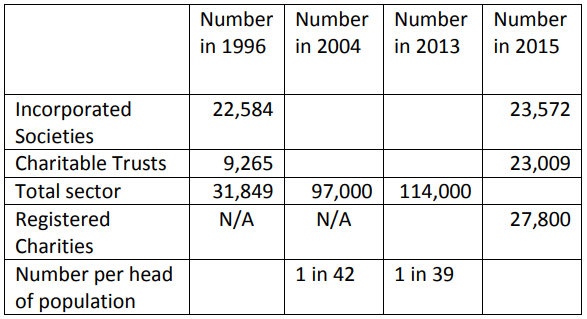 In fact, trying to compare the sector now with the sector 20 years ago is pretty complicated. Schools and Churches have joined the realms of “charities.” There are also various statutory bodies that qualify. And on the other side of the coin, some Charitable Trusts may elect not to register as a Charity. 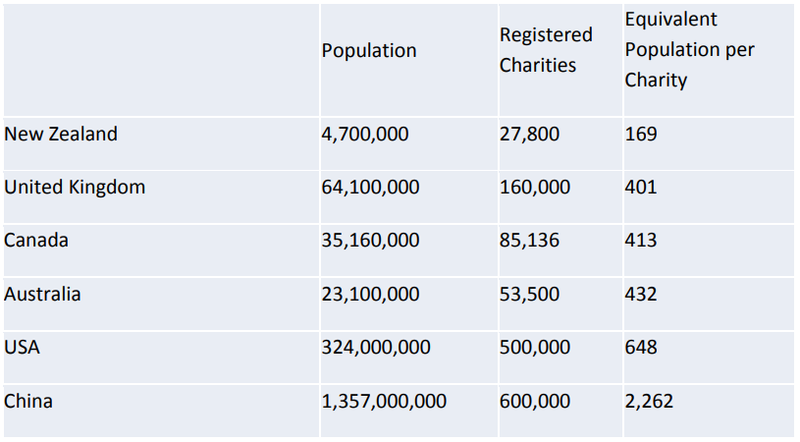 New Zealand has the densest population of Charities in the world. At one Registered Charity for every 169 men, women and children, we outstrip everywhere else by a country mile. It is true that there is no form of organisational contraception in New Zealand. If you don’t like the Charity you have, you simply find someone and you can go out and make yourself another one. So, the question is “should we rationalise?” The answer is “yes,” wherever and whenever it is possible. Does it mean we should stop creating new Charities? The answer is “no.” The sector represents responsiveness to need and opportunity to innovate, so that a moratorium would be both counter-productive and counter-spirited to the nature of the sector. But, teaching the value of contraception could certainly be a good idea. To be fair, our sector in New Zealand includes Churches, whereas that is not the case in the USA. And some other differences can and do exist which might paint a slightly less dramatic picture for New Zealand. But, the picture would not be that significantly different. In the next article in this series, we will look at Charities that fail and the potential causes for that. Original generation time 1.3846 seconds. Cache Loaded in: 0.0005 seconds.